One square dance tip of about 20 minutes has the cardiac benefit of running a mile, and it is a lot more fun! Experts say that laughter helps relieve stress, and you'll probably laugh often while square dancing. Square Dancing gets you out together at a very low cost. Square Dancing is "friendship set to music," and you will meet a lot of fun people. Square Dancing is for all ages. Lessons are open to anyone 13 and older. There are always plenty of people to dance with. No one is left out of the fun. 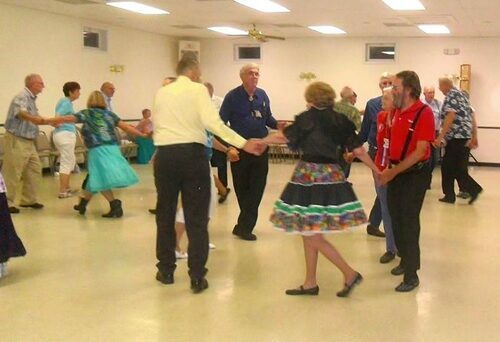 There are Square Dance clubs all over the U.S. and other countries too. Our club was started in 1980 by caller Mike Corns. We dance in St. Charles; our members are from all over the St. Louis area. We welcome dancers of all ages, both couples and singles. We are an established and growing club. Visitors are always welcome at our dances. We also enjoy dancing at other local clubs. Square Dancing has been a part of the United States' culture for over 200 years. It is recognized as a true representation of our country's folk traditions, and remains a popular pastime today due to its health and social benefits. Square Dancing has a colorful history. It began in New England when various immigrant groups brought their national folk dances with them. At the end of the 18th century, when settlers came into the Ohio Valley and founded Kentucky, they realized they could not perform their dances in a big circle on the Green for fear of hostile Natives. They were restricted to their log cabins, so they danced inside with four couples in a square formation. Today 31 states, including Missouri, have designated Square Dancing as their state folk dance. Americans have even introduced Square Dancing overseas, where it has been received enthusiastically in 50 countries. This wholesome recreation is now enjoyed by millions of dancers throughout the world. Square Dance calling is always in English because the calls don't translate to other languages.